A recent statistic from techinasia.com has shown that India has added a staggering 37 million internet users in the space of 12 months, that’s made a total of 137 million internet users overall in India. Not only is this quick growth something to be noted but the fact that this is only 11% penetration and India still holds the title for the third largest internet population in the world, below only the USA and China, highlights the massive potential India has for online activity. As India has the world’s second largest population the prospective marketing opportunities is evident, and these stats point to the internet as the way forward for communication. The era of social media has corresponded with this growth and it seems India has grasped onto this type of activity with both hands, with social media being the second highest form of online activity in India, just 2% less than searching. In fact, techinasia.com reports that social media usage grew 52% last year. 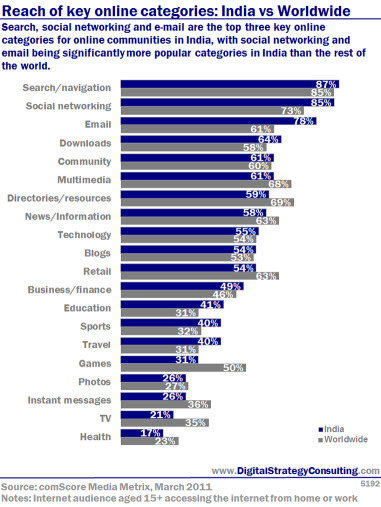 Yet only 5% of India are on Facebook despite India having the third largest Facebook population in the world. Again these trends highlight the country’s digital potential, and the need for brands to take note. The reason that this growth has not fully flourished throughout the entire Indian population mainly stems from the imbalance of urban internet users and rural internet users. With 69% of the population living in rural India and 72% of internet users coming from urban India it is obvious that the rural populace is less likley to connect. This perhaps could be caused by the lack of fixed communication infrastructures in rural areas, therefore it is just more difficult to use the internet as regularly, or maybe the cost of broadband and desktop equipment are just too expensive to buy. Either way, these reasons, among many others, show why mobile devices are becoming more important for brands within India. wearesocial.com reports that mobile subscriptions outnumber fixed line telephones 30 to 1 in India and adds that there are more than 50 million mobile internet users across the country. Techinasia.com report that 36% of mobile subscribers are from rural India. Showing that mobile usage is already high. The increase in affordable phones may be aiding this usage and improved 3G mobile infrastucture in rural areas will further fuel the rise of rural mobile internet users. Although, mobile devices are important with rural India it is also extremely important with urban India. Young Indians are said to spend more than $9,000,000,000 US on mobile activities in 2012, and India is also the second largest telecoms industry after China. All these impressive figures clearly show the already massive, and still rapidly increasing potential India, the internet, social media and mobile devices have for brands and many other industry’s trying to connect with India’s large population.